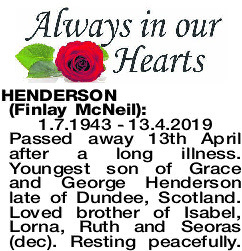 1.7.1943 - 13.4.2019 Passed away 13th April after a long illness. Youngest son of Grace and George Henderson late of Dundee, Scotland. Loved brother of Isabel, Lorna, Ruth and Seoras (dec). Resting peacefully. The Funeral Service for the late Mr Finlay MacNeill Henderson of Bunbury, formerly of Balingup, will be held in the Crematorium Chapel, Belcher Street, BUNBURY commencing at 10am this THURSDAY (18.4.2019).